I am making a cake in Jamaica and have a couple of questions. The Bride is having a three tiered cake. The bottom layer is Strawberry Cheese cake and the other two are normal cake these are no issue. She wants fondant on all three layers, my first question is how long can the cheese cake stay out of the fridge? Also, I am traveling from Canada to Jamaica and plan to take the fondant with me, will it be OK for a couple of days without refrigeration? Hi Helen, Cheesecake needs to be refrigerated. Fondant does not, and should not be refrigerated if possible. So your fondant will be fine traveling as long as it is well wrapped. It will dry very quickly and become impossible to work with. Are you baking your cakes first and traveling with them? or are you baking them in Jamaica? If you are baking first, then the cheesecake and any cake with a filling that will go bad, such as a custard or mousse, will need to be boxed with dry ice. Thanks,they are making the cakes in Jamaica. 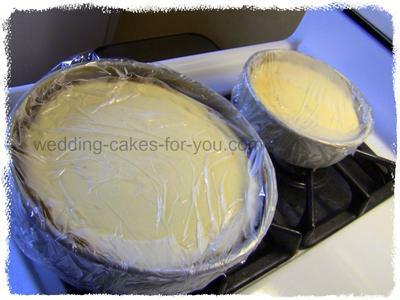 They will dirty ice the 2 normal cakes and then refrigerate all three until the day of the wedding. I need to know how long the cheese cake will be OK, once I have put the fondant on it as i realize once i put the fondant on it it can not be refrigerated. Ok so that makes it much easier then. The cheesecake can be frozen, and now that i think about it, this would be the best thing to do. Starting out with frozen cakes will allow them to stay out longer. Cheesecakes are perfectly fine to freeze and in fact I find it makes them even better. I would say fondant them the evening before the wedding. Store them in the coolest place possible overnight, and you should be fine. Can't wait to see this cake. Good luck. What an exciting cake journey. Please feel free to post here at the website as you go through all of your steps along the way. You can use any of the invite forms and I will transfer the writings to your own page. We could call it "Helen's Amazing Wedding Cake Journey" LOL. I am serious. Let me know if you want to do that or just post away whenever you get the urge.